Opinion Why won't we share our lucky country with asylum seekers? 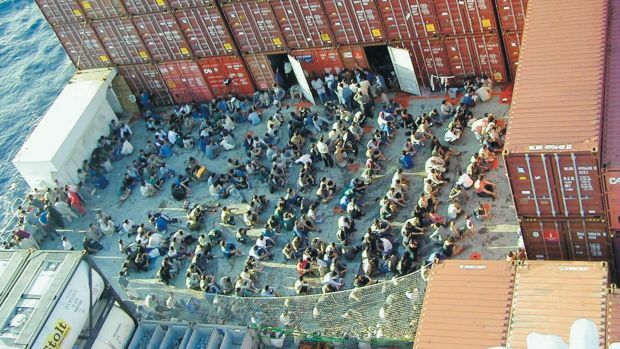 Only the most courageous and vulnerable people get on rickety boats in search of safety, yet we treat them like criminals, writes Julian Burnside. OPINION: There is something indecent about the idea that, in order to prevent asylum seekers from drowning at sea in their attempt to reach safety, you punish the ones who don't drown. Yet, that is precisely what this country is doing. Australia now has the harshest imaginable policies in relation to boat people. Our treatment of asylum seekers is harsher than that of any other country that has signed the Refugees' Convention. Although we see ourselves as a generous, welcoming country, we are seen overseas as cruel and selfish. As people's characters are judged by their conduct, so a country's character is judged by its conduct. Although we see ourselves as a generous, welcoming country, we are seen overseas as cruel and selfish. We treat frightened, innocent people as criminals. Refugees rescued from a distressed Indonesia fishing boat wait on the deck of the Norwegian cargo ship Tampa. The incident in 2001 marked the start of Australia's increasingly harsh treatment of asylum seekers. What separates "us" and "them" - our good fortune and the hardships asylum seekers face - is a play of chance. Or perhaps, as the British poet William Henley put it in Invictus, his celebrated poem of courage in the face of adversity, "the bludgeoning of chance". When Donald Horne wrote of Australia as "the lucky country", his meaning was ironic. But most Australians are incredibly lucky, compared with the boat people who try to reach safety here. In Australia, most members of the community never have to fear persecution; never have to fear the late-night knock on the door; never have to fear for their human rights. It is a hard thing to be forced by circumstances to leave one's country of birth in search of a safe place. The play of chance is worse again for those who must seek protection in a country whose language and culture is radically different from their own. How much worse must it be to find that a bid for freedom ends with punishment as harsh as anything that might have been experienced at home? In August 2001, Australia's SAS intercepted the Norwegian cargo vessel, the Tampa, and took command of the ship at gunpoint to stop the captain from unloading the asylum seekers he had rescued at our request. Since the Tampa episode, we have seen increasingly brutal treatment of people who had ran out of luck in their home country and tried to reach safety in Australia. Since the Tampa episode, 94 per cent of boat people have been assessed, by us, as refugees genuinely fleeing the fear of persecution. Let's be clear: boat people are courageous enough to risk their lives to reach safety, and most of them are escaping the same extremists we are fighting in the Middle East. But I have received messages from many refugees from many countries that say, in substance, "In my country they kill you quickly; in Australia they kill you slowly". I have seen fate bludgeon families beyond endurance, like the Iranian family with an 11-year old daughter who was so deeply traumatised that she tried to hang herself in immigration detention. It was at this point that I started accepting invitations to speak about refugee matters. In my naivety, I thought that if the rest of Australia knew the things I had learnt, the government's refugee policy would not last long. But that was in 2001. Speaking publicly is not the done thing for members of the bar. I was deeply conscious of this as, one by one, professional colleagues and people I had thought were friends turned their backs on me. At one very glamorous social occasion, the wife of a senior colleague sidled up to me and said, somewhat archly, "Do you think it appropriate that a member of the bar should speak publicly about these matters?" With more wit than preparation I replied, "Do you think it appropriate to know about these matters and remain silent?" The conversation ended there. Perhaps I should have asked her instead to imagine if the roles were reversed. Imagine for a moment that you are a Hazara from Afghanistan. You have fled your country and you have come down the north-west corridor through Malaysia and Indonesia; countries that give you a one-month visa on arrival. While you are in Indonesia, you can go to the office of the United Nations High Commissioner for Refugees (UNHCR) in Jakarta and apply for refugee status. If you are a Hazara from Afghanistan, you will almost certainly be assessed as a refugee. But when your one-month visa expires, you have to hide, because if you are found by the police, they will jail you. You cannot work or send your children to school, because if you are found, they will jail you. If the UNHCR has assessed you as a refugee, you can wait in the shadows until some country offers to resettle you. That might take 20 or 30 years. Now, for just one minute, imagine you are that person. Will you wait in the shadows for 20 or 30 years, or will you take your courage in both hands and get on a boat? I have never met an Australian who would not get on the boat. It is a very strange thing that we criticise, revile and punish those who do precisely what we would do if we were in their shoes. We know how chance has bludgeoned people who flee for safety. Chance never did them any favours: can't we? This edited abstract of a speech made by barrister Julian Burnside at the 2015 Hal Wootten Lecture at UNSW was published in the Sydney Morning Herald.